GIA has spent over 15 years analyzing and perfecting the sets of proportions to produce an attractive diamond with the newest advancements in technology. The Cut is the most important factor in the sparkle and brightness. Cut is the specific measures of depth and table percentages, angles and proportions that have to do with the ultimate sparkle a diamond can emit. Cut is divided into 5 different categories. The highest grading of Cut is Excellent. These Diamonds have the best Fire, Scintillation and Brilliance, which is what we see with the naked eye. These Diamonds all have a variety of proportions as well, but they will reflect the most light and shine the brightest. We carry Excellent cut stones here at Donna Jewelry because we know that no matter what color or clarity a diamond is, if it doesn't sparkle, it will not maximize it's beauty. The next level in Cut is Very Good, and as the name suggests, the light reflection is still very high and with the naked eye it will still produce a lot of sparkle. Every small percentage or degree of an angle is determined and analyzed, which is why a diamond will easily fall into the next category. The Good cut level will have less light return and less even patterns. Certain measurements of these types will not be ideal for excellent or very good, but this does not mean they are all bad. With this type, we have to be more specific and concerned with the actual numbers of each individual stone. This just means there are way more stones in this category and a good one with nice percentages can still be very beautiful. This type of cut we can use for very nice pieces such as pendants, earrings or bracelets. These cuts will lack in many components than that of higher cut proportions. The light starts to leak from the bottom and sides of the diamond. The stone will be dark and lifeless. It's not to say that these are not still diamonds at all. 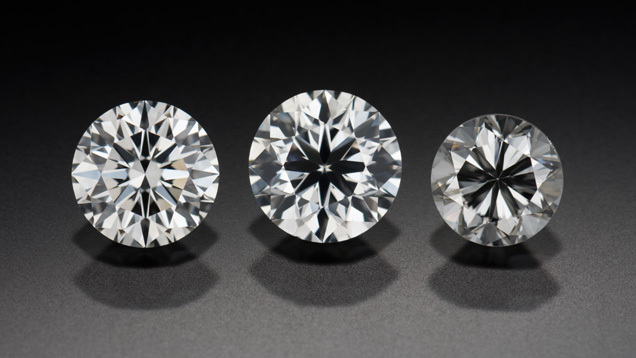 You can always recut a diamond to different proportions for better light reflection, but obviously the weight of the diamond goes down significantly.